A rash indicates an abnormal change in skin color or texture. Rashes are usually caused by skin inflammation, which can have many causes. There are many types of rashes, including eczema. The cause of atopic eczema is not known, but the condition often affects people with a family history of allergies. Many individuals with eczema also have hay fever and/or asthma or have family members with those conditions. Some factors can trigger a flare-up of eczema or make eczema worse, but they do not cause the condition. Eczema triggers include stress, skin irritants (including soaps, skin care products, or some fabrics), allergens, and climate/environment. Atopic eczema can be treated with medications, including over-the-counter creams and ointments containing the steroid hydrocortisone (for example, Cortizone-10, Cort-Aid, Dermarest Eczema, Neosporin Eczema). These products may help control the itching, swelling, and redness associated with eczema. Prescription-strength cortisone creams, as well as cortisone pills and shots, are also used for more severe cases of eczema. For people with mild-to-moderate eczema, topical immunomodulators (TIMs) can help. TIMS — including brand name products Protopic and Elidel — work by altering the body’s immune response to allergens, preventing flare ups. However, in 2005, the FDA warned doctors to prescribe Elidel and Protopic with caution due to concerns over a possible cancer risk associated with their use. The two medications have an FDA “black box” warning on their packaging to alert doctors and patients to these potential risks. 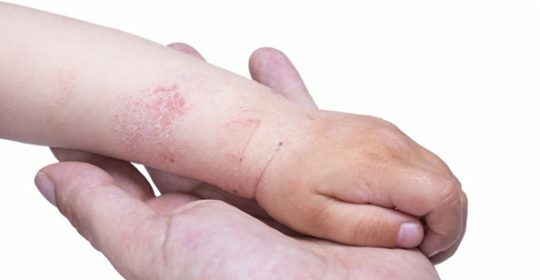 The warning advises doctors to prescribe short-term use of Elidel and Protopic only after other available eczema treatments have failed in adults and children over the age of 2. Phototherapy is another treatment that helps some people with eczema. The ultraviolet light waves found in sunlight have been shown to benefit certain skin disorders, including eczema.